Sizing your rv solar system is an important part of succeeding in your long term goal to have off grid power or be able to provide a certain amount of run time for remote devices in you Recreational Vehicle. There are so many sizes and types of panels on the market. Which one is right? How much solar do I need? How do I size my Rv solar system? Budget for RV solar - Your budget may be the limiting factor of your how much solar you choose for your RV simply because you may want to limit your financial output. 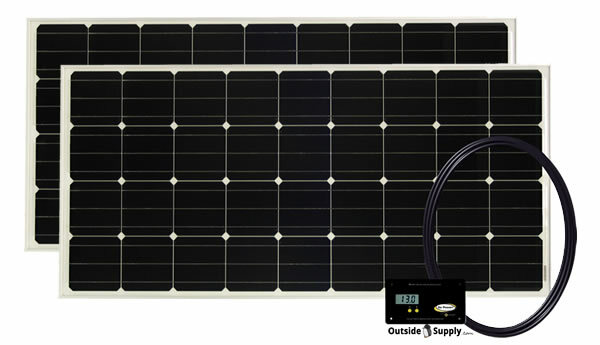 A good RV solar panel system will cost between $500 to $5000 before installation. Roof space to mount panels - Even the guys with the biggest budgets will have some finite amount of rood space. This can also limit how much solar you can have on your motorhome or camper. Panels are rigid rectangles of PV power that do not bend or fold around roof penetrations like air conditioners or vent pipes. So keep the obstructions in mind when laying out your solar panels. Storage for portable solar kits - One way to overcome the roof space limitation is to add a selection of portable solar panels to your solar array in your RV. Even these portable panels take up room and have to be stowed when not in use, so these panels too will have a limit. Usually a camper will run into one of these limits when building a system. Solar will never produce all the power you can use in a day. It will only produce dc electricity at the rate it is intended to. This DC power must be absorbed by your battery bank and used to run your power loads. There are many insufficiency factors in these types of power systems, so there is no easy exact calculation. So put as much solar as you can afford and fit to help meet or accomplish most of your goals. Your solar panels will be storing the power they produce in your batteries when no loads are on. When you are actively using your RV, all of the power used will be either used instantly or stored in your house batteries. These batteries are designed to be a reliable source of power even when Grid power is not available. This is why most RVs operate at 12 volts DC. Many items in motorhomes and campers operate at the 12 volt dc voltage including many water pumps, lights, fans and even some refrigerators. The main purpose of your solar panels will be to charge your RV house batteries. If you have questions about RV battery banks ~ Read our article on proper sizing of battery bank in an RV. For now lets assume you have enough battery for ample storage and operation of the basics loads you want to operate. The next question you will need to answer is to determine how much storage and how much open roof space your RV has available. Determine the uninterrupted sizes that are available. I find it very helpful to map out your rv roof when planning for RV solar and actually laying out your panels. Taking the time to properly layout the panels and map out your RV roof will save hours of guessing on the roof later. To layout panels on your RV roof use our Solar Panel Layout Guide For RVs. Then look to see what panels can fit in this area. It is important that each panel catch at least one beam when installing on your RV roof. This will give you an idea of how many solar panels you can safely install on your RV roof. The other factor is budget. how much money do you have to spend and how many kits can you buy to fit on or in your RV. This is often a good place to start. If you only have $2500 to spend on RV solar and you have a 40 foot fifth wheel. Most likely your best system will include this amount of solar.